You know how you feel when you get something that you have wanted? It is the best feeling. Well I feel very good. I was able to interview the new artistic director of the Dallas Black Dance Theater, Ms. April Berry. Ms. Berry will lead the 38-year-old dance company that has always been led by the founder and visionary and creator–Mrs. Ann Williams. Ms. Berry will lead a company that has been able to grow while other dance companies have come and gone from the dance scene. 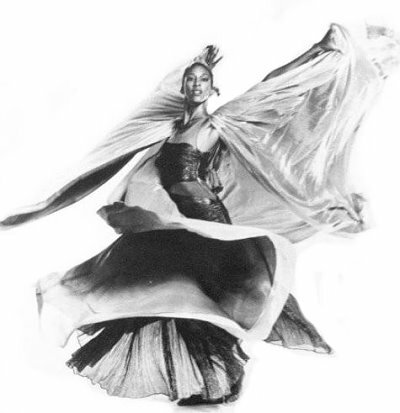 She is a former principal dancer with the Alvin Ailey American Dance Theater. She has been an artist-in-residence of several universities including Ohio State University, and has taught Dunham workshops around the country. I was fortunate enough to catch Ms. Berry between her many obligations to the company and to the city of Dallas for an interview. She is a woman on a mission. At what age did you take your first dance lesson, and was it love at first movement? I was 6 years old, and I took my first lesson at a neighborhood dance school. It was love at first movement. I began to take my dancing seriously at about the age of 12 when I asked my mother if I could attend a school that stressed both the arts and academics. She allowed me to attend the National Academy of Ballet and Theater Arts in middle school. If not dance, then what would you have done? Teaching the arts would be something that I would have done, and I do. You tried out for the Alvin Ailey Dance Company three times, what gave you the tenacity to never give up? I knew this company was for me. I had attend the Ailey school on scholarship, and I knew it was for me. The first time I tried out, I was told that I was too young. The second time I was told that I didn’t have enough stage experience, and was told to go and get some experience. The third time, I told myself this was it. If they don’t choose you the third time, then it is basically over. At this audition there were about 500 girls trying out. It was a two-day audition. On the second morning, there were about 150 girls left. At the end of the day they chose 3 girls and I was one. I can remember asking why it took me 3 years to get selected. Mr. Ailey told me, I now had the experience, and I had the look they were looking for that year. I sometimes think that our young people aren’t equipped to accept disappointment. When you talk to young people, do you share this journey with them? I always share this story with them. I stress that sometimes the reason you are not chosen especially in the arts is that it not about your talent or shill. It maybe that you are not the type they are looking for at the time. Sometimes they want you to go away and get more experience to see if you are willing to put in the work. I tell young people they should be strong, accept critiques, be resilient and be flexible–have faith and believe. I saw you perform with Kevin Brown to “Fix Me Jesus”, it was beautiful. Thank you, that was during my younger years. There are several dance companies that have ceased to exist or gone together such as the two companies that make up the Texas Ballet. How has the Dallas Black Dance Theater been able to sustain itself? The company has always had the unique and strong vision of its founder, Mrs. Ann Williams. She knew where it started and where it was going. She had a long-range and long-term vision. The infrastructure was put in place that would work. The company has been able to retain and recruit the products (the dancers) on the stage. The company has a motto which is “It will get done one way or the other”. I saw the company a couple of years ago during Easter service with the St. Paul United Methodist Church at One Arts Plaza, and I think I read that the company will perform on Easter Sunday again. Yes this service is on the calendar. We will also be performing in Fort Worth at the Scott Theater on March 20 during the Dancing Beyond Borders series. What is your vision for the company? Growth, growth in terms of artistry. The dancers who are fantastic also need growth and inspiration. They need to stay engaged. I want new choreography whether local, regional, national or international. I want new people to help elevate us and help us grow in our artistry. I want to open up the academy and increase the attendance by offering more and different classes for all ages. I would like to bring in new dance faculty. I would like for the company to perform more regionally–around Texas. Besides the Dallas/Fort Worth area, what has been your favorite city to live in? Oh my that’s a hard one since I love this area. There is so much to do from shopping, arts, the lakes are here and the hospitality. I love the aspect of family and faith. You know I’m from New York, but I think I would choose Charlotte North Carolina. I just like the friendliness of the people. Thank you so much for your time Ms. Berry I look forward to seeing the company perform, do you have any questions for me? I would love to know what your readers would like to know about the Dallas Black Dance Theater, do they come out to the performances regularly in Dallas or Fort Worth? I’m sure they do, we’ve been to the Wyly Theater often to see them. I know that people in this area like dance. I can’t remember, I think it was the Dance Theater of Harlem that performed last year at the Bass Hall. We made it a family outing with cousins from here and East Texas bringing our daughters. I am a firm believer that you can’t be what you have never seen. I remember taking my youngest one to the opera. She told me she didn’t know if she would go back, and I told her at least she had been to a performance. That is so right, when I decided I wanted to train seriously my mother took me to see a dance company and thank goodness it was the Dance Theater of Harlem. That’s when I saw ballerinas of color–African-American on stage–that just got me more excited about having a career in dance. Please keep us in mind when you have performances and activities. Thank you again. Thank you. Remember “thisisyourbestyear”. Make it a point to see the Dallas Black Dance Theater this coming year. I know you will enjoy it!